Cake Couture, created and inspired by Carmen Emerson-Bass. 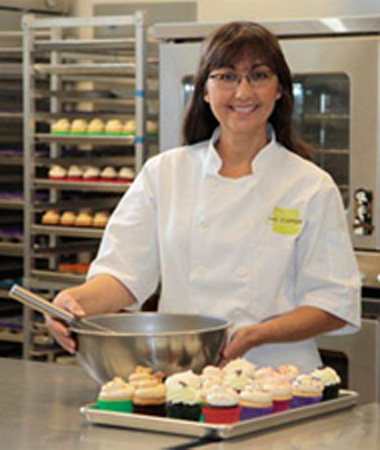 Cake Couture is Honolulu’s premier bakery for classic baked goods with a flair. Carmen’s innovative style blends traditional and familiar recipes with unexpected and creative flavors, resulting in a delicious and unique product. The menu and offerings changes with the seasons. Our neighborhood bakery strives to produce exceptional baked items, that will fulfill everyone’s dessert needs. Cake Couture’s cupcakes, individual cakes, cookies, brownies, and bars, owe their exceptional look and flavor to carefully sourced ingredients, crafting bold combinations of flavors and textures. The menu features items created from the highest quality ingredients, and changes to ensure an inspiring, ever evolving menu. We start our day early in the morning using real butter, eggs, fresh fruit, and the finest chocolates, to ensure that our products are the freshest available. The aroma in our bakery is invigorating. Beauty of the islands, fashion, and great food…these are things that inspire me. Born and raised in Honolulu, and my extensive travels to Europe and Asia, influenced my decision to put all my passions together and become a cake designer. In 1997, My formal training began in San Francisco at the renowned California Culinary Academy specializing in Baking and Pastry Arts. Furthering my education, I attended several cake decorating schools, including Notter International School of Confectionary Arts, with famous cake designer Colette Peters. I did custom wedding and celebration cakes for over 10 years, and in 2007, I opened the first cupcake exclusive boutique in the islands. Cake Couture is a culmination of all my passions whisked together. Cake Couture’s store is architecturally inviting, and the cupcakes, brownies, cookies, and personal cakes are exquisitely executed. I trust when you visit us, and enjoy our baked deliciousness, you will experience the things in life that I am passionate about, and hope you are too… these personal cakes are an expression of me. To view our current Baked Deliciousness.